For four years Flanders will be in the international spotlight for the commemoration of ‘The Great War Centenary. Tens of thousands of international visitors of all ages, some of whom will have some form of accessibility requirement, are expected to travel to the area. 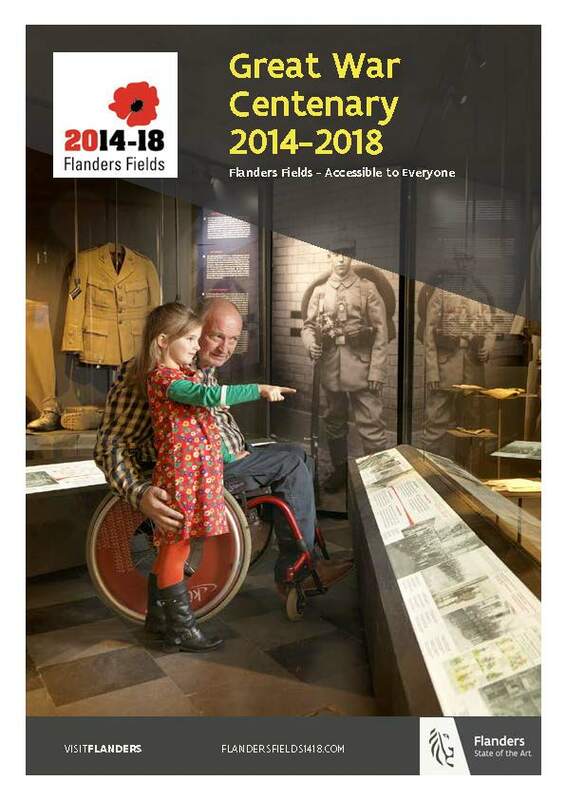 To this end, Visit Flanders has initiated the “The Great War Centenary - accessible to everyone” project. The project strives for the integral accessibility of the activities commemorating WW I for the broadest possible public. Download the Guide from the right-hand panel in PDF format. Visit Flanders is seizing upon the commemoration period in Flanders Fields to implement a comprehensively accessible holiday chain, and will therefore promote the detailed provision of information in consideration of all aspects of an accessible stay: information and reception, accommodation, restaurants, cafés, great war sites, transportation, parking spaces, assistance and care, etc.… Not everything that is claimed to be accessible has been included in this brochure. Our information is always based on an objective independent on-site inspection. We use the A and A+ label, produced by Visit Flanders to indicate the level of accessibility of accommodation, tourist information offices and visitor centres. Specially developed for this project, a W symbol (basic accessibility) and W+ symbol (comfortable accessibility) will be used for the other categories. This brochure also contains a small number of initiatives that did not obtain one of these labels, but we believe that some people with a (physical) disability can experience them to a certain degree. You will find more information about the labels and symbols on the following pages. also report on initiatives offering additional facilities for other forms of disabilities, such as visual, hearing or learning disabilities. Whether something is accessible depends to a large extent on the person concerned. After all, each disability or limitation is different. We therefore also recommend that you always contact the venue concerned beforehand to get the information you need from your own perspective. While the information in this brochure is certainly not complete, we believe it provides a good starting point. You can, of course, always ask us for additional information, as well as submitting tips based on your own experiences. If you want to learn more about the story behind the ‘Great War Centenary’-project, you can visit the website www.flandersfields1418.com. A number of must-sees in this brochure (those sites, buildings or museums that are certainly worth visiting within the context of the Great War Centenary) are indicated by a star.